Jackson Police announce 2018 "Employee of the Year." The Employee of the Month committee for the Jackson Police Department are pleased to announce their selection for 2018 “Employee of the Year.” The Employee of the Month committee selects Officer Joseph Lawley as the Jackson Police Department’s “Employee of the Year.” Officer Lawley was previously selected as September’s Employee of the Month for the Jackson Police Department. Officer Lawley continues to possess the best of attitudes as an officer of the Jackson Police Department. He genuinely enjoys being a police officer. Officer Lawley is a proactive officer who makes good cases. 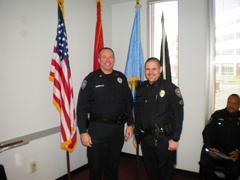 He is also an excellent Field Training Officer for the Jackson Police Department. He is a patient officer who goes above and beyond in his efforts of explaining information to victims of crimes. Officer Lawley also reaches out to the young people who live in his assigned district. He tries his best to be a good role model for these young people. Officer Lawley uses his pleasant personality to assist in diffusing situations. Officer Lawley is very dependable. He can be counted on to handle any task given him. He is not afraid to learn new and challenging things within the department. 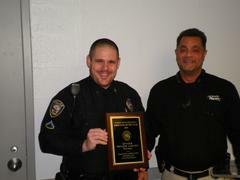 Congratulations Officer Lawley! Job well done!